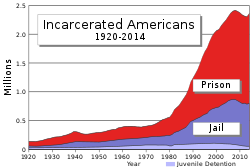 The United States has the highest rate of incarceration in the world, with 2.3 million Americans behind bars, a 300 percent increase since 1980, the report states. This country has more inmates than the top 35 European countries combined. While the costs of housing prisoners -- $50 billion annually for state correctional costs alone -- should be enough to cause us to rethink our way of doing things, the overall societal and human costs should be even more convincing. Bank of America Corp., the biggest U.S. lender, extended a freeze on foreclosures to all 50 states as concern spread among federal and local officials that homes are being seized based on false data. It was more like Normandy than Puerto Rico. Boarding planes in the middle of the night, hundreds of FBI agents, analysts and examiners flew into Puerto Rico before dawn Wednesday and took down about 130 local police and law enforcement personnel on corruption charges, in what the Justice Department called an “unprecedented” bust. In all, as many as a thousand FBI personnel took part in Operation Guard Shack, according to FBI and Justice Department officials. Last week, the D.C. Board of Elections and Ethics opened a new Internet-based voting system for a weeklong test period, inviting computer experts from all corners to prod its vulnerabilities in the spirit of "give it your best shot." Well, the hackers gave it their best shot -- and midday Friday, the trial period was suspended, with the board citing "usability issues brought to our attention." Here's one of those issues: After casting a vote, according to test observers, the Web site played "Hail to the Victors" -- the University of Michigan fight song. "The integrity of the system had been violated," said Paul Stenbjorn, the board's chief technology officer. Federal safety officials unveiled a more comprehensive crash rating system for vehicles that for the first time evaluates how women fare in accidents by using female crash dummies and takes into account side pole crashes and crash-prevention technology such as electronic stability control. The Transportation Department and its National Highway Traffic Safety Administration said it would now issue an "overall vehicle score" that combines the results of a frontal crash test, side crash tests and rollover resistance tests. It compares the results with the average risk of injury and potential for vehicle rollover of other vehicles. Counter-terrorism analysts still lack the data-search tools that might have kept a bomb-wearing Al Qaeda operative from boarding a Detroit-bound airliner nine months ago, and probably won't have them any time soon, U.S. officials acknowledge. At the same time, officials say the terrorist threat against the U.S. is becoming more complex, with a greater risk from home-grown militants whose low profiles makes sophisticated intelligence analysis more important than ever.